Thank you all for your very persuasive comments on my last post. My sister has either not read my blog this weekend, or is deliberately ignoring our heartfelt pleas. Until I can discern which is the case, let's move on. Friday night Husband and I caught "Dogma" on one of the movie channels. If you know anything about me, you don't have to extrapolate much to realize that I love that movie. I would like to marry that movie. If I wasn't already married, I would marry Kevin Smith because I love him for making that movie. Within the first five minutes, two of the main characters touch upon pretty much every issue I have with faith, organized religion and ecclisiastical law. One of the biggest problems that I have with Christianity, is the whole "washing away of sins" thing. In the case of Catholicism, this comes in the guise of plenary indulgence. It's an interesting, if somewhat convoluted concept and Kevin Smith runs with it. In a nutshell, two displaced angels, Loki and Bartelby (played by Matt Damon and Ben Affleck) have discovered a loophole (plenary indulgence) whereby they can get back into heaven. The last Scion (played by Linda Fiorentino) is dispatched along with two prophets (played by Jason Mewes and Kevin Smith) and Rufus, the forgotten black 13th apostle (played by Chris Rock and....snort), to stop them and thereby preserve the human race. They try to persuade Cardinal Glick (played by George Carlin, how funny is that??) 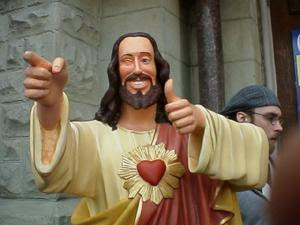 not to go through with the ceremony to celebrate the centennial of his church, during which he plans to offer plenary indulgence to anyone who seeks it, as part of a Catholic renaissance and public relations overhaul, in which they are also replacing the crucifix with "Buddy Christ" as the new Catholic icon. Bartleby and Loki plan to take advantage of that blanket pardon, transform into humans by pulling off their wings and then die to ascend into heaven. I think that's a fairly inventive plan. Unfortunately, their success would cause an end to reality as we know it, since it functions on one very important principle, that being; God is infallible. To prove God wrong would subvert the very thing which allows existence in the first place. You have to admit, it's a pretty interesting premise. However, the movie is not for the easily offended. There's a lot of foul language, irreverence and questionable behavior on the part of supposedly divine individuals. If you take those things very seriously, DO NOT watch the movie. Remember, I warned you. I am not responsible for any indignation, outrage or crises of faith that might arise should you choose to watch this movie. But if you're able to have a sense of humor about religion, watch it. It's fantastically funny and clever. Kevin Smith is a satirical genius. I guess the reason this movie resonates with me so much is that it illustrates several very elementary obstacles to faith, all of which have proven completely impossible for me to overcome. First, one has to believe that just by asking for forgiveness and accepting Jesus as one's savior, one becomes worthy of salvation. This is something I just cannot wrap my mind around. I find it fundamentally illogical. A horrible person can spend his or her life being wretched and unkind and even murderous, and yet, all they have to do is accept Jesus and they are saved. Presto chango, they are now worthy to walk through the pearly gates. As far as I know, there is no disclaimer that says they have to mean it. But a person who spends their lives being good and kind and generous will go to hell simply because they can't make that leap of faith? Or because they choose not to believe in a supreme or divine being? Nope. That does not jive with me, for numerous reasons, not the least of which is that fact that it creates justification for judgementalism and promotes divisiveness among the human race. Second, one must be willing to suspend belief and accept the Bible as a literal interpretation of historical events. I just don't have the capacity for that kind of blind certainty. I am a born cynic, I guess. Tales of burning bushes and plagues and parting seas only serve to make me less inclined to put my faith in such a dubious account of theological history. Not to mention the fossil record, which sort of disproves the entire chapter of Genesis. Third, one must ally one's self with a certain brand of Christianity in order to be embraced by a given denomination and deemed worthy of inclusion and church sanctioned approval. One has to be willing to denounce those who subscribe to different faiths as inferior. Worse...one has to believe in one's heart that they are damned and deserve it. I think the Crusade thing, the Holocaust thing and the Jihad thing have effectively demonstrated the folly of that kind of bigotry. But still it persists. And Christians divide themselves into little enclaves of self-righteousness and piety when they could be living in harmony with one another. They shun other religions as heretical and condemn their followers as idolators, when they could be learning from one another. "None of them have gotten it right. Because they have all failed to realize that it doesn't matter what kind of faith you have, as long as you have it." Amen, I mean, er...Right On, sistah. Thanks for this. I LOVE, LOVE this movie, especially because of the reservations I have about faith. They lost me when I was about 8 and I had to memorize John 3:16 for Bible School, and I said, "You mean everlasting life isn't really everlasting life?" I have the same objections, and I certainly don't aspire to be a literalist, but it's not necessary to buy into all three of those things to have "faith," or even any of them. There are many who claim to follow Christ while simultaneously avoiding the second and third points you cited, and some rare few, even the first. There are also faithful in many other faiths, as well as those who believe that all faiths are the various languages by which human beings "speak" to their Creator, or creative energy, or whatever—and all are therefore valid, reaching towards the same being/force that no human can fully understand. My husband and I went to see that movie when it was first released. We both loved it. Kevin Smith had a special on something, or maybe it was a dvd extra, where they showed footage of him protesting this movie. It was hilarious. He made his own sign and joined the protesters. I agree with your post completely. I was raised Catholic, but never found the answers to my questions there or in any organized religion. I can't believe in a God who cares more about what church gets my money than how I treat others or the world. Definitely one of my favourite movies ever. I love this movie - very clever and definitely brings to light many questions in faith. I feel the same way as you in many ways. Good post! Wow. I've never seen the movie, but now I'm curious. You're opening up a big ol' can of worms, here, ya know. And I'll add my 2 cents, not to argue, but to respectfully disagree. What if...........just WHAT IF - What if there really IS a heaven, and there's only ONE way to get there? What if Noah's Ark and a bunch of other events happened? (Read up on the great flood - history proves it.) What if the Messiah showed up, quietly, and changed the world? And what if, as humans, we found ways to disagree about all of it? What if it's TRUE? My dad got in to heaven at the end of his eleventh hour. I wish he'd figured it all out sooner, but that's not my call to make. That one lies between him and his Creator, and I am not the judge of who goes where or why. I'll leave that up to God, and yes, I believe HE is real. Period. I do not perceive other faiths as inferior. Ever. In time, my kids learned to reply with something along the lines of, "Well, if heaven is filled with judgmental and bigoted people with attitudes like yours, I'd rather not go there anyway, thanks!" From someone who considers herself a Christian, amen. Speaking as a Christian, I do feel it is true that many Christians are hypocritical and judgmental. But I believe there is hypocritical and judgmental people in every religion and among non-religious people as well. Unfortunately all it takes is a few wackos from any group to paint a negative picture of the whole group. Sadly, there are a few too many Christian wackos out there. All I would ask is that you don't paint all Christians with the same brush. Unfortunately, you probably get an extra heavy dose of hypocritical Christians here in the South, and I say that as a Southerner. Personally, I believe if more Christians would actually live out there faith instead wallowing in their own self-righteousness, people such as yourself might have a different perception of them. At any rate, that is my personal goal--to live out my faith, and by that I DO NOT mean shoving it down everyone's throat that I come in contact with. I believe the Christian life is evident in our actions more than our words. As the saying goes, talk is cheap. As always, you've given me something to chew on, but not only that, this post made me stop and think about how non-Christians perceive Christians. i saw that movie years ago and remember liking it a lot. and the rest of my comment would be way too long and convoluted, so i'll leave it with that. My husband - who is a pastor - and I LOVE this movie, and think it probably has the BEST theology of any mainline movie out there. and to briefly touch on a few of your points. not all christians take the bible as a literal interpretation of historic events (it's a RELIGIOUS book and not a HISTORY book and any fool can see it contradicts itself on facts all the time, but erm, i know there are those that disagree with me), not all denominations feel that if you are not one of them you are damned (check out ELCA lutherans and episcopalians, to name just 2), yes there is a difference between SAYING something and MEANING it (and Jesus talks about that) and yes, Christians have through all of history and even now today done a long list of small and huge acts of atrocity in the name of faith. Clearly we haven't gotten it right yet. And that is where I am thankful for grace. Even for those I disagree with. Even for those who do, in my mind, horrendous things. 2) heaven is a giant Disneyland in the sky. The purpose of life is to grow into the potential for which we were created: to be as loving, as wise, and as generous as we were created to be. Not everyone IS growing in that direction - in some cases, we're actually going in the opposite direction, becoming more hardened and selfish with time. The common-sense solution is that we should try harder to be good. We might, for instance, listen to regular preaching on how to behave, and then do our best to follow those principles. In the end, if we try really hard, we might be good enough to be accepted by God. The gospel says something different. It says that a relationship with God is not the RESULT of trying really hard to be a good person; it's a PREREQUISITE to being a good person. This does not have to imply that only religious people are good, or even that religious people are better than others - the things that draw any of us towards our potential are all, in some way, a reflection of God: people, music, nature, art. Real faith will not make me better than anybody else - but if it IS real, it will make me better than I was. And that's where the most salient critique of religion tends to come in: there are certain people who seem to be made WORSE - more self-righteous, more judgmental and just plain mean - by their faith. All I can say about that is that such religion does not honour God. God doesn't enter into relationship with us because we're good; we only ever progress towards goodness because God's grace comes first. The salvation that comes by faith is not a free trip to Disneyland - it's a relationship with God where the only thing we need to bring to the table is our willingness to know him and to be changed by that knowledge. I loved the movie too, though it's been years since I saw it. I might have to add it to my Netflix queue! I haven't thought about that movie in quite awhile. I love it for all those reasons. I think the quote pretty much says it for me. It is about faith and believing -not religion. I have contradictory ideas and beliefs even in my own head. I believe in God and Heaven- I think. At least I want to, very badly. I say I am Christian when asked, yet the whole Jesus thing seems weirder to me than the God thing- which is pretty weird. I think that is why I believe. If it were not true and a part of our makeup, how in the world could anyone think that concept up? The thought of a horrible person getting into heaven has to do with forgiveness. I have issues with it too. And belief of course. I would much rather it be a matter of deeds. I tend to think it is a little of both- there goes that contradiction in my head again. I think if I am a good person, GOd will give me some leeway for being a skeptic who is always searching. I don't think Christians are the only ones going to heaven. But I think that maybe you can get in just by accepting and believing. If it is wrong I think God will give you some leeway for the fact that that is what you were taught. The theory goes that if you believe you will be a better person so you will be doing good works anyway. Now that last minute reprieve you are talking about? That's just pure love and forgiveness. As a parent I can understand it. So, if we think of God as a loving parent (and I do) then I can see it. If someone REALLY believed and was repentent then I think God would forgive and let them in. I can't imagine ever telling my child that I did not forgive him when he was sincerely sorry. I can't imagine anything he could do that would make me stop loving him and want him back. If he murdered someone I would be crushed, and sick, and hate that part of him, but I would still ove him. And yes, there is a clause about it being for real. You can't just say it. Again, it is assumed that the all knowing God will know if you are sincere. I was raised in a Protestant household, and one of the things I never ever could get past was being taught in Sunday School about all the poor little babies who died in deepest darkest Africa and were automatically going to Hell, not because they didn't *accept* Jesus; no, it was because they never even had a chance to HEAR about Jesus. Now there's a catch-22 for you! As always, a thoughtful and interesting post, BA. Thanks.